Rasmea’s lawyers file motion “to protect defendant from additional harm” | Fight Back! Detroit, MI - Defense attorneys for Rasmea Odeh, the Palestinian American icon who was wrongfully convicted in a politically-motivated, federal immigration case, filed a motion yesterday in response to last week’s ruling by Judge Gershwin Drain that Rasmea would have to submit to up to 18 hours of a government expert’s examination of her mental state. The defense motion asks Drain to “require the government to disclose the identity and all other relevant information concerning the expert…and to identify any formal tests that the designated individual intends to administer.” The defense had asked for this from the U.S. Attorney’s office for the Eastern District of Michigan, and was refused. Last week, Drain sided with the government, and will compel Odeh to undergo intensive psychological evaluation by a government forensic examiner, even though the judge knows she is a survivor of vicious physical, sexual, and psychological torture at the hands of the Israeli military. For this reason, the defense is asking for additional, “simple modifications” of the judge’s order, like a neutral site for the examination, allowing Odeh to have a companion with her, and a clear explanation of the exact amount of time needed for the government to assess her. In addition, when the defense asked for the name of the government expert, the prosecution responded with a return to its wild claims that “defense counsel will then foment harassment of the expert by the supporters of the defendant.” Observers of the case will remember Assistant U.S. Attorney Jonathan Tukel’s attacks on the Rasmea Defense Committee, when he called her supporters “mobs and hordes.” And even though it appears that Tukel has been removed from the case, U.S. Attorney Barbara McQuade’s office is still engaging in similar racist attacks against Rasmea’s supporters. The 69-year-old Odeh is a legend in the Palestine national movement. In Drain’s courtroom in 2014, she was convicted of a politically-motivated immigration charge, and in 2015, sentenced to 18 months in prison and deportation. 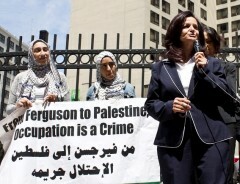 Rasmea won an appeal of the decision, arguing that Drain had denied her defense the right to make its case. The appeals court sent the case back to Drain for an evidentiary Daubert hearing, scheduled for Nov. 29, where the government will attempt to challenge the validity and admissibility of testimony from Fabri. The decision to allow the government expert, who will clearly try to discredit her, to meet with Odeh before a Daubert hearing is an unsound legal decision, because a defendant’s mental state is not necessary “for the court to decide the admissibility of an expert’s testimony,” according to the defense. It is also an unsound moral decision, because even with the safeguards described in yesterday’s defense motion, the ordeal will still be retraumatizing for Odeh. The defense committee is mobilizing to fill the courtroom in Detroit for the Nov. 29 hearing, which falls on the International Day of Solidarity with the Palestinian People; is demanding "Hands off Rasmea" and "Drop the charges now"; will continue to educate the public on Israel’s crimes and this specific case; and asks supporters to help raise money for the defense.